Thrill seeking party boy Sean Strayger (Andrew Keegan) and his friends support a lavish lifestyle by running drugs across the Mexican border in private planes. When Strayger meets the beautiful and mysterious Rosanna (Natalia Cigliuti), high-flying fun takes a dangerous turn. If the feds and drug lords don't get them, the speed just might. SYNOPSIS: Thrill seeking party boy Sean Strayger (Andrew Keegan) and his friends support a lavish lifestyle by running drugs across the Mexican border in private planes. When Strayger meets the beautiful and mysterious Rosanna (Natalia Cigliuti), high-flying fun takes a dangerous turn. If the feds and drug lords don't get them, the speed just might. 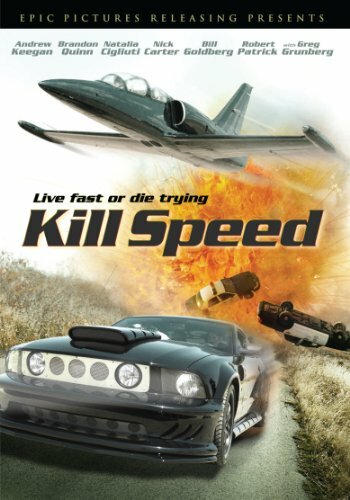 A group of young, speed-freak pilots make a killing by transporting crystal meth across the Mexican border in their supersonic planes. Chasing the adrenalin-fuelled Hollywood lifestyle of girls, parties and endless stacks of cash, they take ever greater risks. But when they are asked to fly in their biggest shipment yet, 900 pounds or $2.7million - of meth, their antics attract the attention of the FBI that wants to smash the supplying Mexican cartel. Caught up in a deadly and duplicitous game of cat and mouse, the fly guys are about to run their craziest mission yet. A high octane mix of Fast & Furious and Top Gun, Kill Speed stars Goldberg (Ex WWE Champion), Greg Grunberg (Heroes, Lost), Robert Patrick (Walk The Line), Tom Arnold (True Lies) and the Backstreet Boys' Nick Carter.